I recently got a product that, I've been waiting for, for a very long time, the Hercules 3D Prophet III GeForce 3, it is the latest and greatest in a long line of Hercules Graphics cards, currently the fastest consumer graphics card around, it has been previewed on the net for the last few months, this is one of the first Hercules GeForce 3, UK reviews to hit the net. As always Hercules put together a very nice package, Blue is a very in colour at the moment and Hercules have again fitted a large blue heat sink and RAM sinks, the PCB is also the cool blue colour. To connect it to the display device Hercules Provide normal SVGA output, Digital out (DVI) and also SVHS out, these 3 connectors will enable you to output all your favourite games and DVD's to a normal monitor, large screen televisions, and also something I saw recently projectors for that really big screen experience. The GeForce 3 is the latest in a long line of excellent graphics cards, from NVIDIA the leaders in consumer graphic cards and 3D acceleration. The GF3 features a 3rd Generation GPU, the GPU has all the features of the older GeForce GPU's coupled with hardware FSAA (quincunx) along with FSAA the GeForce 3 also supports Environmental Bump Mapping (EBM) Along with a fully programmable GPU, which has hardware Vertex and Point Sprite facility's, Games available now don't use many of the new features available. 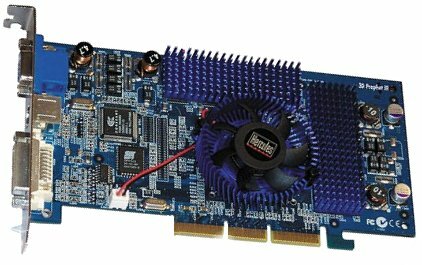 EBM which Matrox supported in the G400 series cards is used in a few games, but other than that the new features in the GeForce aren't really used much at all in current games. Just arriving on the scene now are a few benchmarks and some games that use some of the potential of the GeForce 3, 3DMark 2001 is one benchmark that uses the GeForce 3 features, Vulpine's GL Mark 1.1 is another that test's OpenGL performance, in terms of actual games that truly test the GeForce 3's capabilities, right now there really isn't much to choose from. Upcoming titles including Doom 3, and Unreal 2 will be written to utilise the power that the GeForce has. The GeForce3 Drivers are fully Direct x 8 compatible, offering game designers and programmers the opportunity to use every single dx8 feature they can. Most of the demo's I've seen seem to include some very nice looking water effects, with reflection and refraction of the light, these all add up to a much more realistic scene with very high polygon counts. As I said previously at the moment there aren't really any games which actually use all the features. The GeForce 3 will still obviously play any current game at a very very high speed, in terms of raw speed in current games such as Unreal Tournament and Quake 3 the GeForce3 runs at similar speeds to the GeForce 2 Ultra. FSAA is one area where the GeForce3 can tower over the GeForce 2 series even in current games, as it uses hardware the GeForce 3 will only really shine when new games come out which fully exploit the GeForce 3 GPU. There are a few games which do use some of the features, these include Dronez, on the benchmark side there are a few 3DMark2001, Vulpine GLMark 1.1. I downloaded Everglade Rush a demo which uses some of the GeForce 3 features, the water effects look pretty spectacular compared with the standard rendered image from a GeForce 2. Power, acceleration, precision, and flexibility – all wrapped up in a fragging powerhouse. This is the 3D Prophet™ III. Now you can control and dominate in gaming arenas anywhere. NVIDIA®’s enhanced GeForce3™ processor further improves any 3D graphic-pumping game, and with the new Lightspeed Memory Architecture™, gameplay speeds are unsurpassed - even in the highest resolutions. You know you’re looking for the greatest in gaming splendor and glory, so grab hold of the gear that can give it to you."